Stephen J. Shoemaker is Professor of Religious Studies at the University of Oregon and author of The Death of a Prophet : The End of Muhammad’s Life and the Beginnings of Islam. 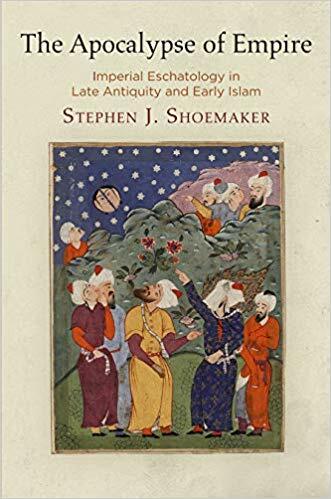 In The Apocalypse of Empire, Stephen J. Shoemaker argues that earliest Islam was a movement driven by urgent eschatological belief that focused on the conquest, or liberation, of the biblical Holy Land and situates this belief within a broader cultural environment of apocalyptic anticipation. Shoemaker looks to the Qur’an’s fervent representation of the imminent end of the world and the importance Muhammad and his earliest followers placed on imperial expansion. Offering important contemporary context for the imperial eschatology that seems to have fueled the rise of Islam, he surveys the political eschatologies of early Byzantine Christianity, Judaism, and Sasanian Zoroastrianism at the advent of Islam and argues that they often relate imperial ambition to beliefs about the end of the world. Moreover, he contends, formative Islam’s embrace of this broader religious trend of Mediterranean late antiquity provides invaluable evidence for understanding the beginnings of the religion at a time when sources are generally scarce and often highly problematic. Scholarship on apocalyptic literature in early Judaism and Christianity frequently maintains that the genre is decidedly anti-imperial in its very nature. While it may be that early Jewish apocalyptic literature frequently displays this tendency, Shoemaker demonstrates that this quality is not characteristic of apocalypticism at all times and in all places. In the late antique Mediterranean as in the European Middle Ages, apocalypticism was regularly associated with ideas of imperial expansion and triumph, which expected the culmination of history to arrive through the universal dominion of a divinely chosen world empire. This imperial apocalypticism not only affords an invaluable backdrop for understanding the rise of Islam but also reveals an important transition within the history of Western doctrine during late antiquity.